I initially thought that I would keep the posts without pictures, but it doesn't seem to give you much besides whatever details I decide to write. So, I'm just going to post one or two pictures based on the POI and just reference where I got the picture (unless I'm told to take it down). Neuschwanstein (originally named New Hohenschwangau but renamed after King Ludwig II's death) is a famous castle in Munich, Germany which is said to have been the inspiration behind the Disney's Sleeping Beauty Castle. 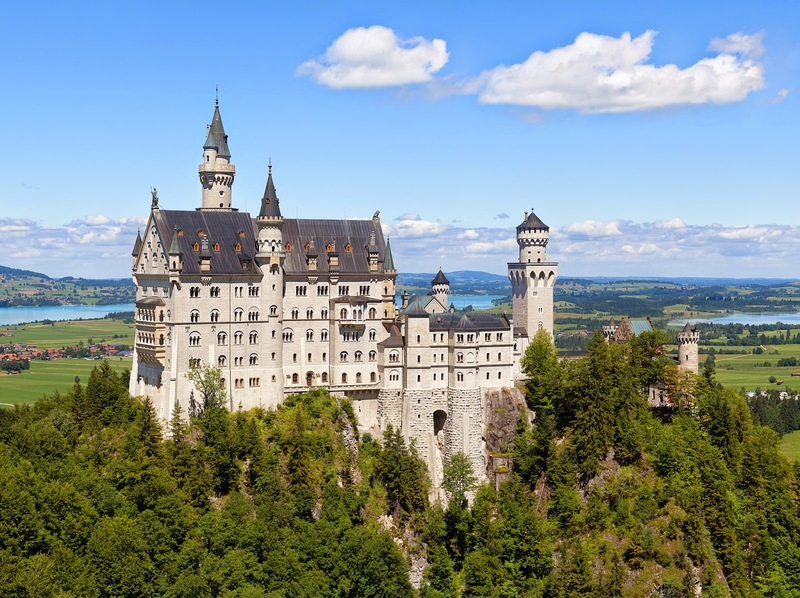 The castle itself was built by Ludwig II of Bavaria as a retreat castle. The castle wasn't actually complete since King Ludwig II had to take out massive loans to build (the exterior is complete but the interior is not). It actually got to the point where he was trying to borrow more money but was ousted by the government. Shortly after he was ousted, he was found died. After he died, the palace was open to the public to paying visitors in order to pay off the construction loans. It took 13 years (1886 - 1899) before this happened. Here are some interesting stats on this castle. It took almost 15 years to build (1869 - 1884), and was built on the ruins of two previous castles. It was expected to have over 200 interior rooms but in the end, only 15 rooms and halls were completed. In total, there is a total floor space of 65,000 sq. ft. Opened to the public since 1886, over 61 million people have visited the castle. More than 1.3 million annually and as many as 6,000 per day in the summer. Operating hours and admission prices are subject to change, but for when we expect to go this September, it will be 12 euros and it includes a guided tour of the castle (35 minutes). Be sure to visit Marienbrücke for a photo-op of the castle and landscape. It is a bridge built in the 1850s as a birthday gift to Maximillian II's consort Marie. Built high above the Pöllat Gorge. No photographs allowed instead the castle.